I wanted to share a book that I will be reading and also the author's interview. I love hearing why the author wrote what they wrote. If you want to be one of the first to read Liesl's Ocean Rescue check out AMAZON - the book is only $3.99 on AMAZON. Perfect for the Book Lover on your Holiday Shopping List! 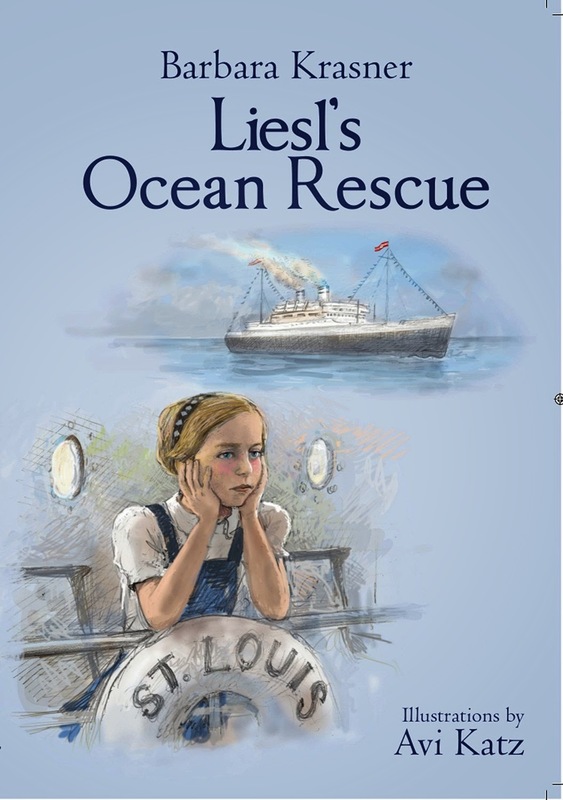 Liesl’s Ocean Rescue by noted children’s author Barbara Krasner, recounts the story of Liesl Joseph, a 10 year old girl aboard the ill-fated MS St. Louis. On May 13, 1939, together with her parents and 937 other Jewish refugees they left Germany on the MS. St Louis attempting to seek temporary asylum in Cuba. Accomplished artist Avi Katz has beautifully illustrated this age- appropriate, yet historically accurate story. Liesl’s Ocean Rescue is a worthy and strong addition to Holocaust literature and curriculum at the elementary school level. An excellent bibliography of supplemental resources will facilitate teaching of a difficult but necessary subject. The poignant and uplifting account should encourage our children to stand up for what they believe is right and to make a positive difference in the livers of those less fortunate”. Barbara Krasner is a historian and professor of creative writing. She publishes the popular blog, The Whole Megillah: The Writer's Resource for Jewish-Themed Story. She runs workshops and conferences for Jewish writers at the Highlights Foundation and in conjunction with the Association of Jewish Libraries. Barbara has a B.A. in German from Douglass College, an M.B.A. in Marketing from the Rutgers Business School and an M.F.A. in Writing for Children & Young Adults from Vermont College of Fine Arts. She is a candidate for the M.A. in Applied Historical Studies at William Paterson University. Illustrator Avi Katz was born in Philadelphia where he studied in the Schechter and Akiba schools as well as the Fleischer Art Memorial. After three years at U.C. Berkeley he moved to Israel at age 20, where he graduated in Fine Arts from the Bezalel Art Academy. He was the staff artist of the Jerusalem Report Magazine from its first issue in 1990 until 2012, and is active in the international Cartooning for Peace program. He has illustrated over 160 books in Israel and the U.S. including the National Jewish Book Award winning JPS Illustrated Children's Bible. His books have also won the IBBY Hans Christian Andersen Honors four times and Israel's Zeev Prize six times. His art has been exhibited in Israel, America and Europe. Is it difficult to write about the Holocaust for young children? The objective of a children’s book is not to “dumb it down” but to explain difficult-to-understand concepts clearly and effectively. To do so, I believe, it helps to have a story about a person who undergoes extraordinary circumstances. In Liesl’s Ocean Rescue, Liesl and her family escape from Nazi Germany on a ship, the MS St. Louis, bound for Cuba. They think they are heading toward freedom. But complications arise and their journey to freedom will take much longer and a more circuitous route than they had planned. I consider Liesl’s Ocean Rescue a gentle introduction to the Holocaust. It’s difficult to write about the Holocaust for any audience. How and why did you choose Liesl as your heroine? While interviewing Liesl at her home in a Philadelphia suburb, I got the sense of who she was as a child. She helped the elevator man. She helped the steward call passengers to dinner. She adored her father. She was a bit of a tomboy. She had a strong voice. Plus, as the daughter of the chair of the ship’s passenger committee, she might have been more likely to know about some of the political and financial matters going on. How did you go about finding material for the book? Another children’s writer told me she was having difficulty writing about the St. Louis. She had done some initial research at the U.S. Holocaust Memorial Museum (USHMM) had the 1974 book, Voyage of the Damned, that was very comprehensive. She handed me the materials in a canvas bag and said, “Good luck!” I read that book and a book by staffers Scott Miller and Sarah Ogilvie, Refuge Denied. I then contacted Scott and he shared with me the names and contact information for St. Louis survivors in the New Jersey/Pennsylvania area. One of them, Hans Fisher, lived right across the river from me. I started with him and with a telephone interview with Herbert Karliner, who has positioned himself as the spokesperson for the survivors. This was in 2010 and I was working full-time then. I took some vacation days to spend a few days in the archives of the USHMM and the American Jewish Joint Distribution Committee (“the Joint”). Through the Joint’s efforts, the passengers were able to find safe haven in England, France, Belgium, and the Netherlands. Well, safe haven at that time in June 1939. Fortunately, Liesl and her family went to England, although her father was thought to be an enemy alien and was interned on the Isle of Man. Why did you choose to fictionalize this story? While Liesl was certainly already a strong character on her own, her story needed more shaping. I based my storyline on what she could have done. Maybe she did. She died in August 2013 and I was not able to share the manuscript with her. That was the same month I drafted my first version. Have other books been written about the MS St. Louis? For young readers, there have been two others: A young adult novel, The Other Half of Life, written by Kim Albon Whitney and published by Knopf in 2009, and Kathy Kacer’s To Hope and Back: The Journey of the St. Louis, a fictionalized account of two survivors for middle grade readers, published by Second Story Press in Canada in 2011. Kacer’s book is far more representative of the truth. For adults, besides the two I’ve mentioned, is Martin Goldsmith’s memoir, Alex’s Wake, published in 2014 by DaCapo Press. Goldsmith’s grandfather and uncle were aboard the St. Louis. The book details his search for them. Wow the research is great. I need to read this one. Nice interview.